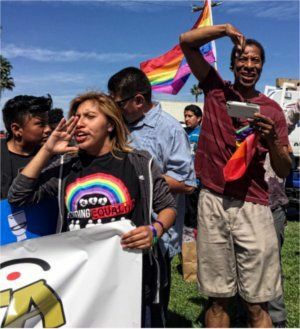 Los Angeles — Transgender and queer students at a high school here scored a victory for the entire lesbian, gay, bisexual, trans*, queer community on April 21 when they won the right to have the first gender-neutral bathroom in the Los Angeles Unified School District. 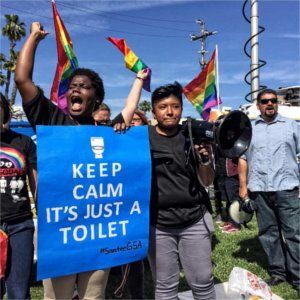 For several months, the Gay-Straight Alliance (GSA) at the Santee Education Complex in historic South Central LA has been organizing for a gender-neutral bathroom after trans* student Alonzo Hernandez, 16, faced problems when trying to go into the girls’ bathroom. LGBTQ students celebrate victory at Santee school. Alonzo transitioned from female to male and said they* were uncomfortable going to the boys’ room since students and staff mainly recognized them as female. (*The pronoun that some transgender people choose to be identified by is they/them.) Alonzo said they often waited all day to use the bathroom because of the difficulties. When news came out that this LA high school would be the first school in history to let students of different genders use the same bathroom and that a sign would be hung saying “All-Gender Restroom,” right-wing homophobes mobilized. On April 19, these bigots and reactionaries protested outside the school and even attacked some of the students. However, the students, teachers and community were quick to respond and called a counterdemonstration in support of the GSA for the following day. One of the key organizations they called for support was Union del Barrio, a community-based, revolutionary, grass-roots organization that takes up many working-class issues. Spokespeople Ron Gochez and Benjamin Prado applauded the students’ militant work and expressed their firm alliance with the LGBTQ students. Hundreds of students, teachers, community groups and even elected officials came out to support the queer students. 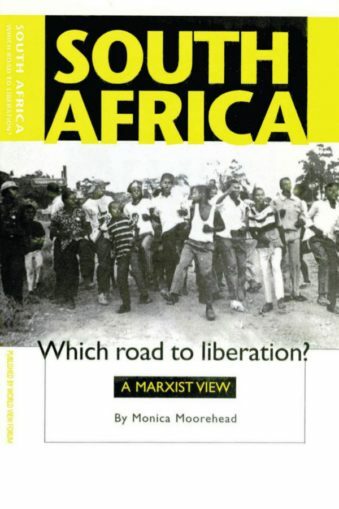 It was a wonderful show of progress on this issue. The victory in South Central LA demonstrates that despite reactionary attempts to push queer people back into the closet, like efforts in North Carolina, the LGBTQ community and its straight supporters are more advanced than ever; revolutionary and forward-thinking ideas on gender will prevail. ohn Parker of Workers World opened the rally. The Gay-Straight Alliance at Santee is urging the movement to use the hashtag #itsjustatoilet. Trans* is used with an asterisk to indicate the spectrum of all the different genders of people who do not conform to the either/or of male/female or masculine/feminine. Teresa Gutierrez is campaign manager for Workers World Party’s 2016 presidential ticket and a longtime lesbian and immigrant rights activist. WWP is running Monica Moorehead for president and Lamont Lilly for vice president.